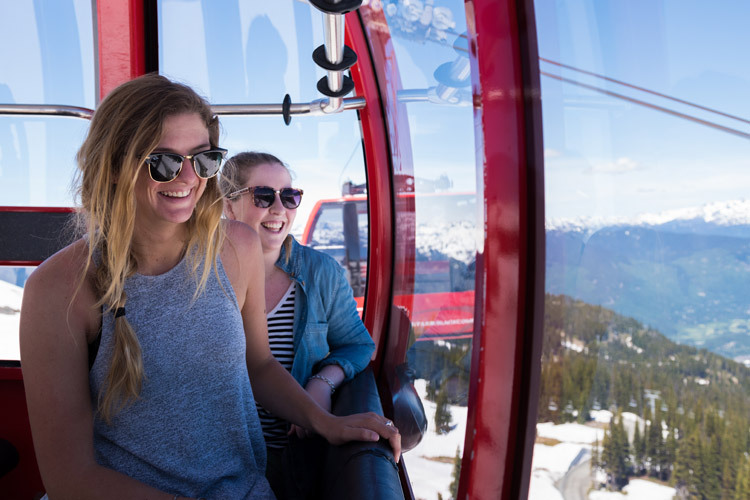 In Whistler the ski slopes and après patios are great places to catch up with friends, but not everyone skis and sometimes it’s nice to get away from town for a while. Beyond the village there’s plenty of places to escape and the Callaghan Valley, located just 20 minutes south of Whistler by car or shuttle, is the perfect example. It’s close enough for an easy day trip but far enough to be away from it all, it’s right out in nature and there’s a ton of things to do once you get there – perfect for just hanging out. Earlier this winter the girls from @GoWhistler and I took an early day from work to get some much needed fresh air and chill time. It was a brilliant afternoon filled with memorable moments, from the road trip to watching ski jumper soar, wandering the snow-covered forest and lazy fireside chats. Check out the photos from our adventures below. The minute we turned off Highway 99 to drive up to the Callaghan Valley it felt like the adventure had begun. 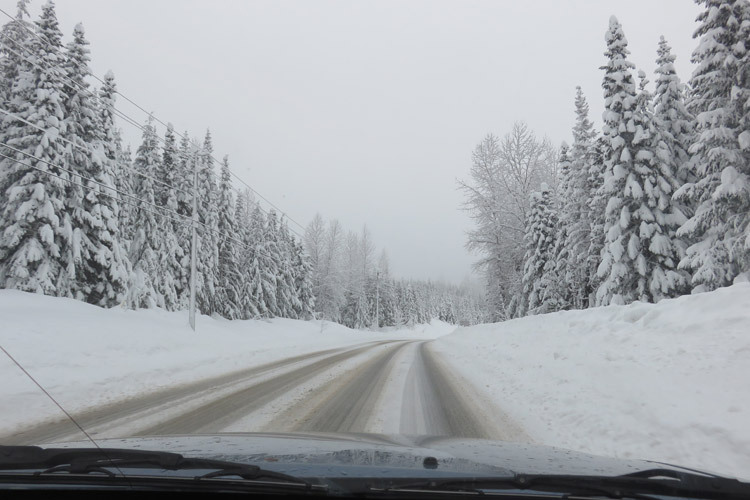 Directions to the Callaghan Valley are here – it’s a short drive but note winter tires and winter driving skills are essential. 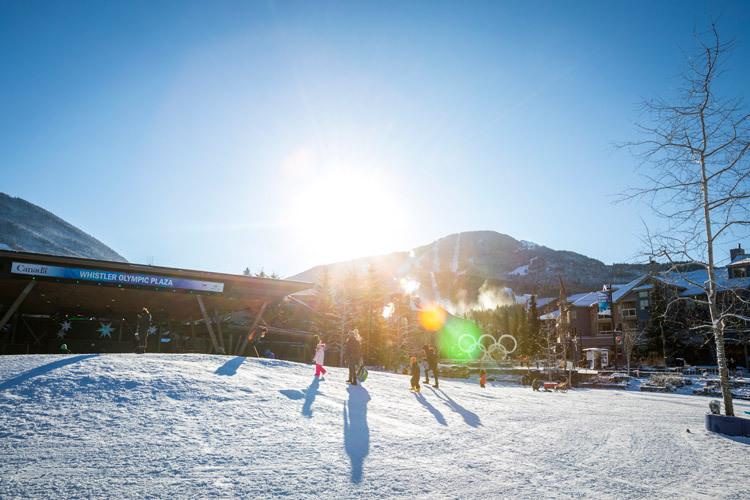 Option B – grab a shuttle from Whistler. 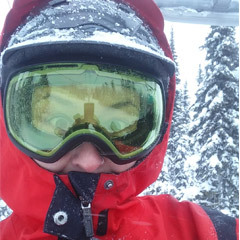 Ski Callaghan combines two massive recreation areas known as Callaghan Country and Whistler Olympic Park. 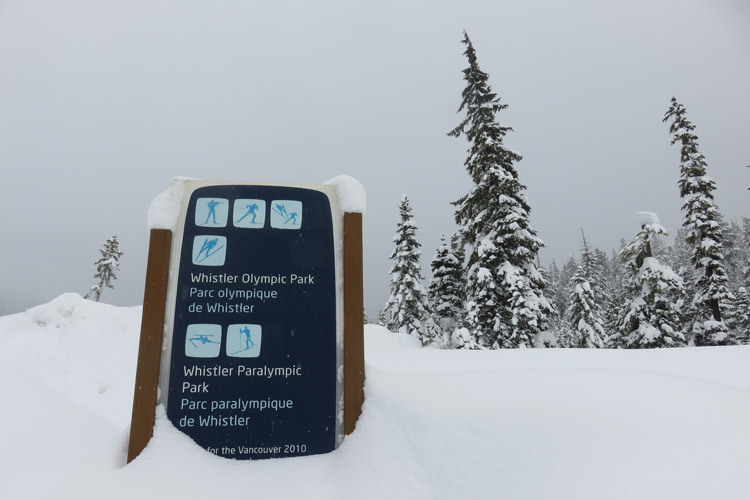 The Whistler Olympic Park side (the one with the genuine bonafide Olympic Games signs everywhere) has the best access to all the activities, so we pulled in there. 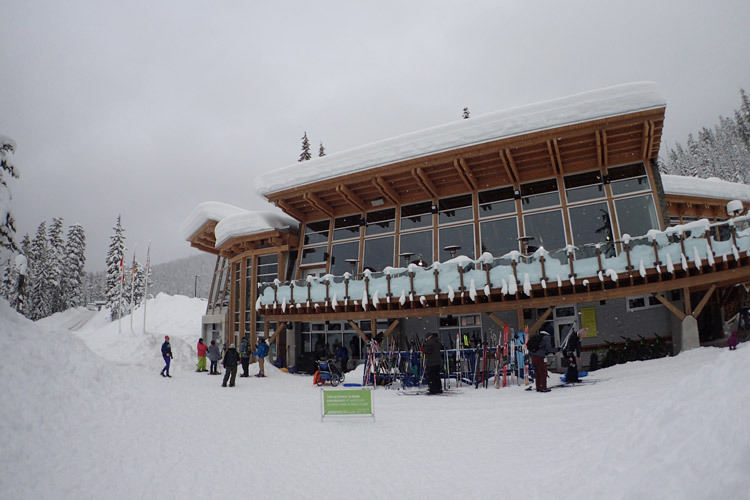 Love this daylodge – washrooms, yummy food, gear and the start of all the trails. 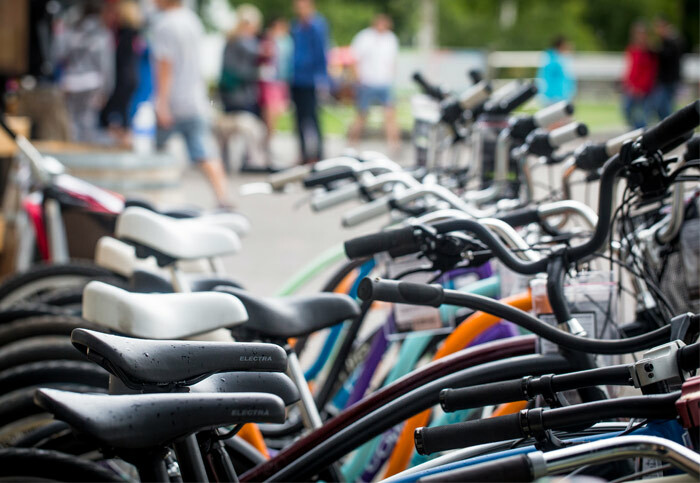 It makes for a fun community feel with everyone gearing up and heading out from the same place, and the staff are super friendly and helpful. There’s a big patio too – a little snowy the day we went but perfect for people watching on a sunny day. 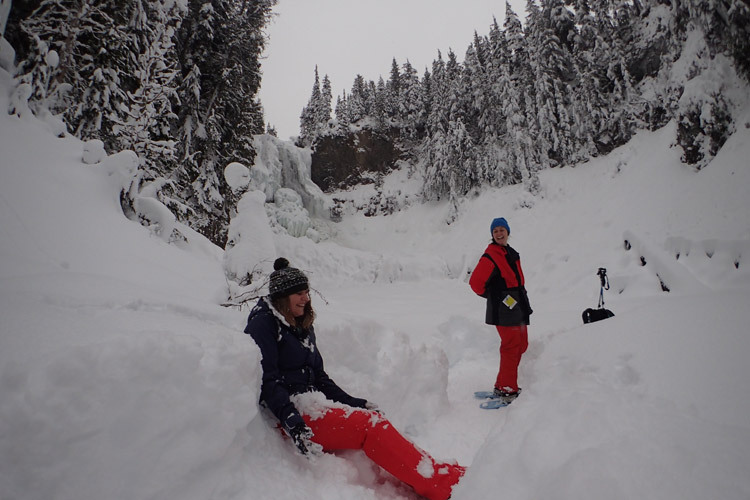 We needed to escape for a while and get some cardio, so Em grabbed rental snowshoes, Sarah and I strapped on our own and we headed out from the Callaghan Country side to find Alexander Falls, one of the Sea to Sky’s gorgeous waterfalls. 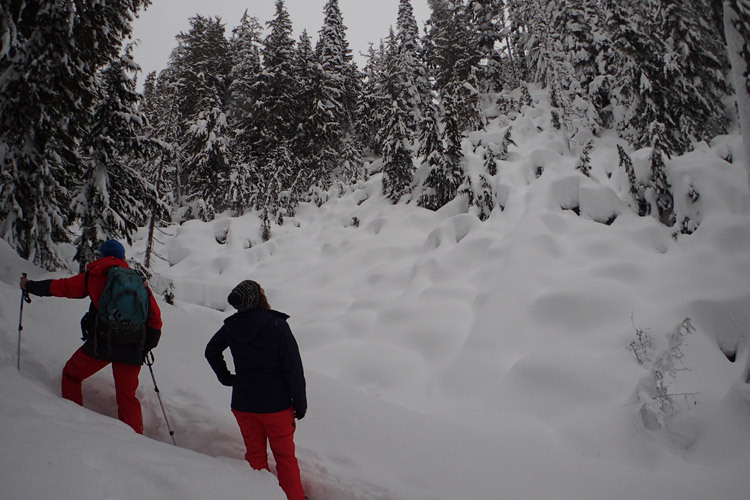 I love snowshoeing. It’s so easy to do, and it can take you to some absolutely beautiful places in winter that you can’t reach by car or normal hiking. 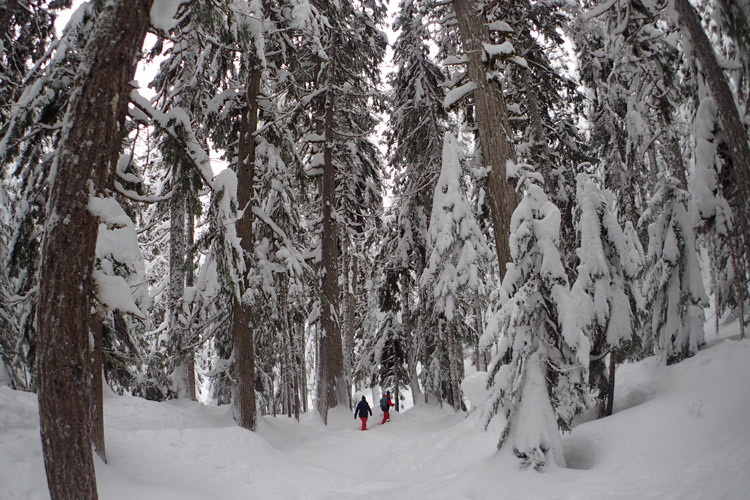 With all the fresh snow out that day it didn’t take us long to find ourselves deep in the silence of this magical forest – not another soul around. A little up, a little down and we made it to Alexander Falls which was almost completely frozen. The viewpoint was the perfect snack and snow play spot too. 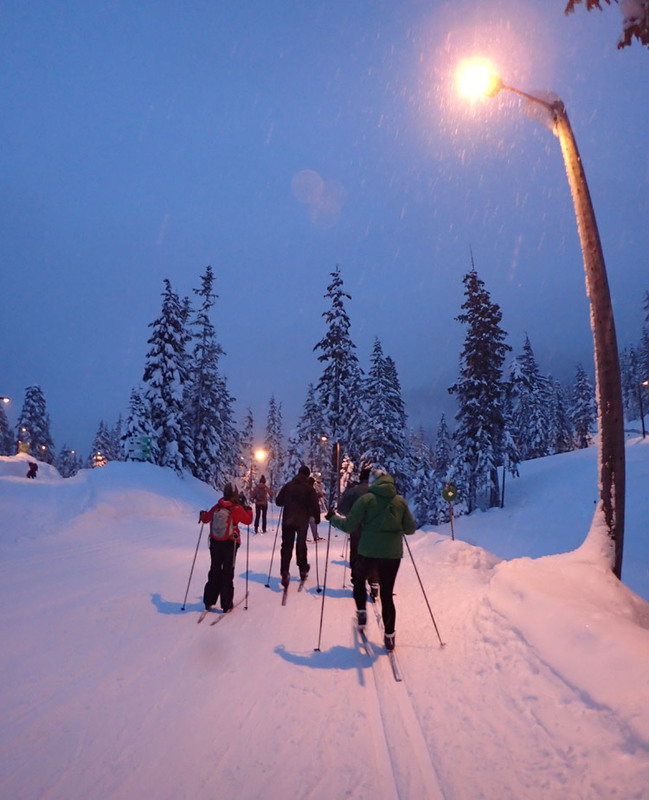 By the time we got back to the lodge the daylight was fading rapidly…but Wednesday nights at the Callaghan they turn on the lights until 9 PM for skiing and snowshoeing – plus you can explore other trails with your own headlamp if you feel adventurous. 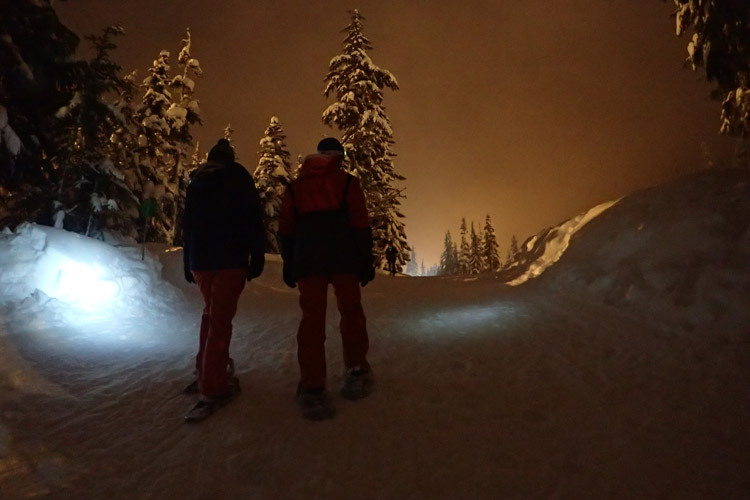 There’s something extra special about being in the snow at night-time. It’s quiet, the light reflects through the clouds and falling snow dances gently in pools of light. 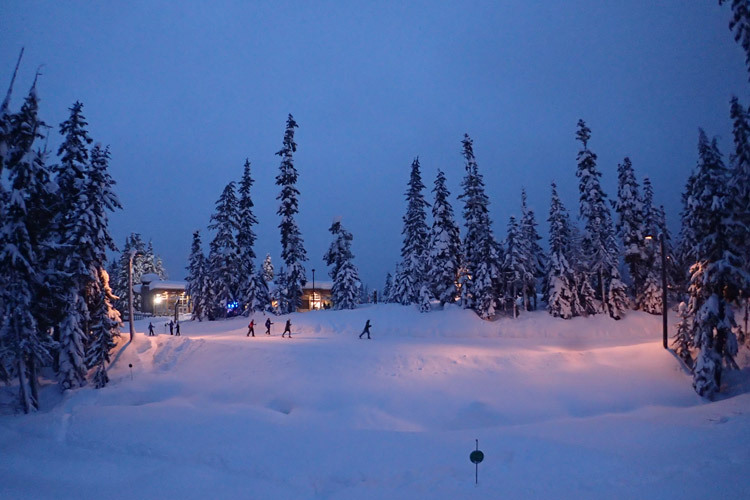 There were plenty of people out and about with groups and families sliding and chatting under the lights. 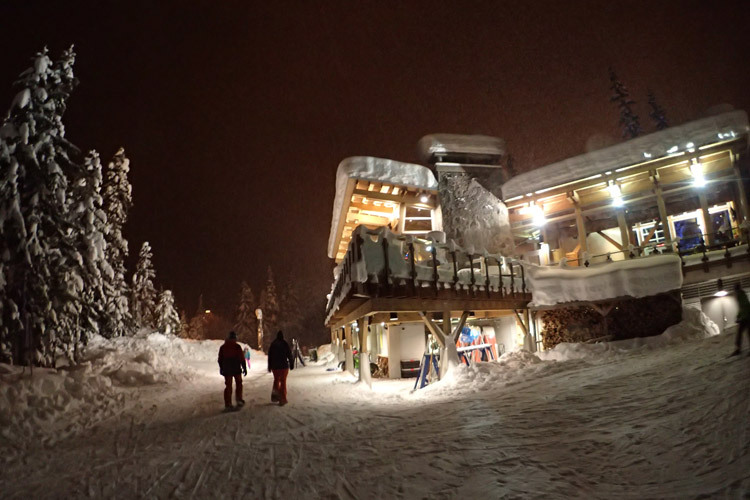 The Wednesday specials on entry, rental and skiing make the evening attractive and affordable – not a bad way to spend a night at all. To round off a perfect day, we sought out the firepit to warm up. They keep this going on Wednesday nights, and everyone is welcome to toast marshmallows and hotdogs here. 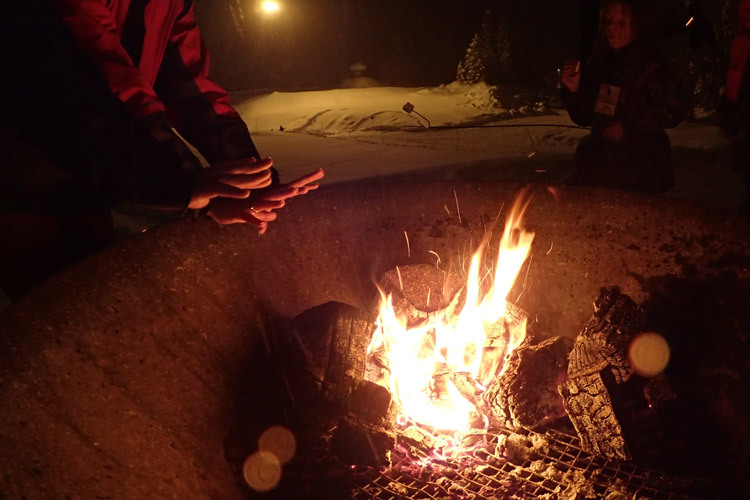 The firepit is right by the well-lit toboganning area, making it a great spot for parents to keep warm while the kids play. 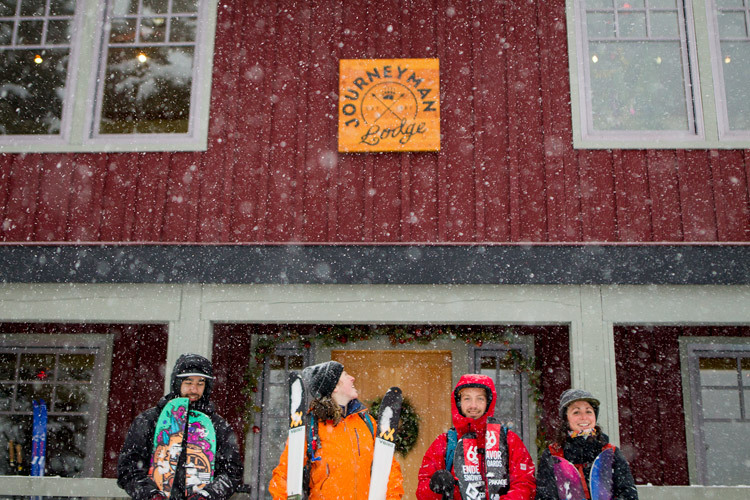 After all that sliding, spectating, snowshoeing and hanging out at the firepit we headed back to the lodge for a bite to eat . Did we sleep well after this? You betcha – dreaming of next time we come out. Cross country skiing with the dogs – who’s in? 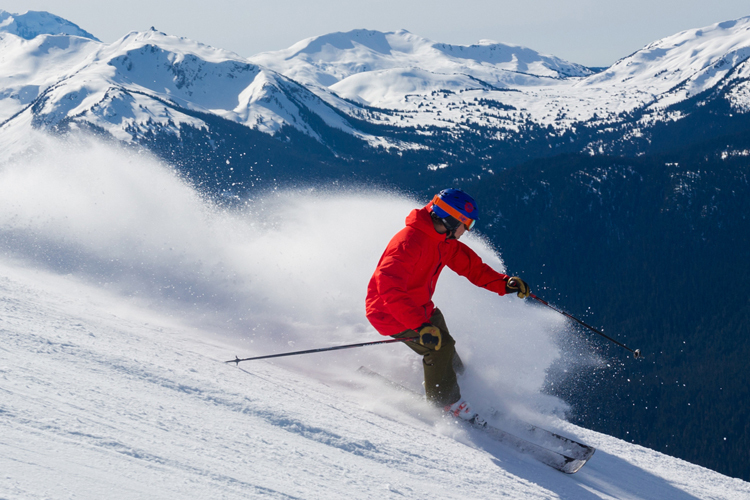 Whistler’s got a ton of things to offer away from the ski slopes. 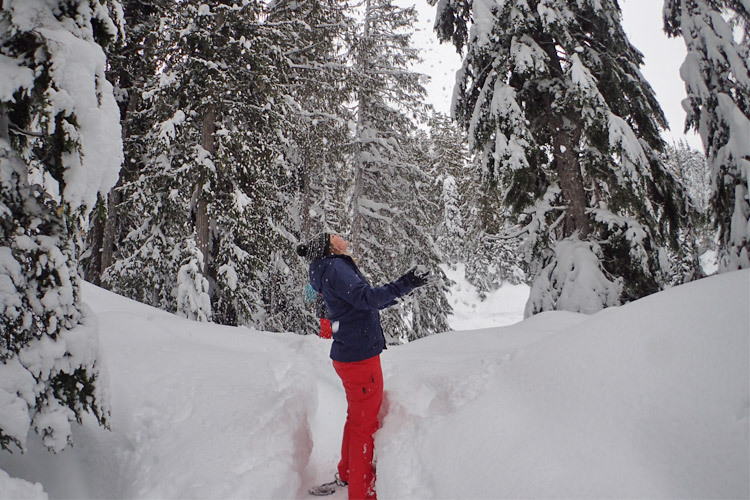 Learn more about discovering winter beyond the village at Whistler.com and for more memorable moments, follow @GoWhistler on Facebook, Twitter or Instagram. Images thanks to Pip Campbell and Emily Smith.